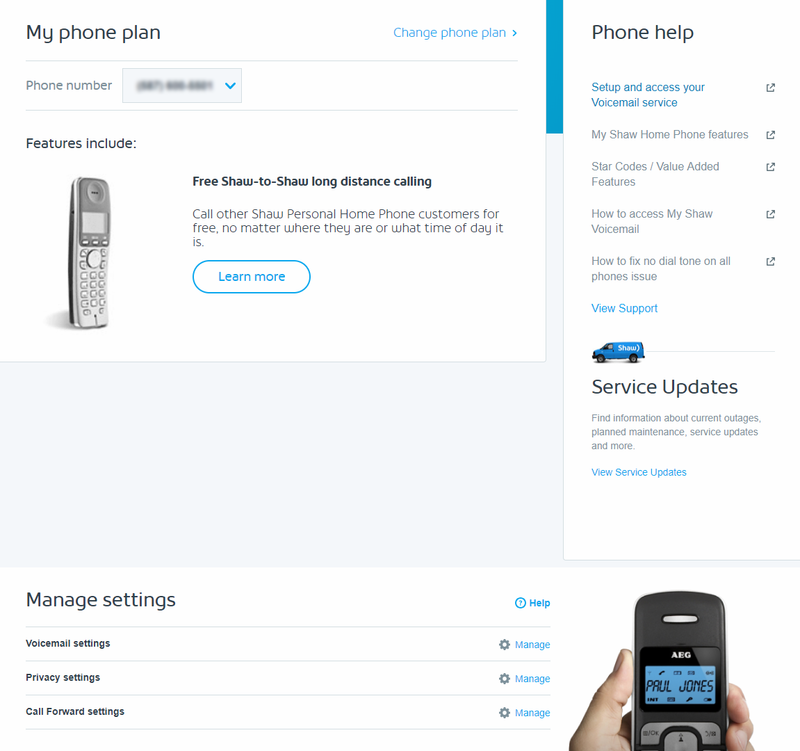 Discover how to set up and manage your Shaw Business Call Forward features and learn different methods to use the Call Forward option with your business phones. Call Forward is available on Business Phone and Business Phone Plus plans. Call Forward works to Canada or US destination numbers only. If your Shaw Business phone plan includes Multi-line Hunting</link, Call Forward management should be done only from the primary line. Setting up Call Forward on a secondary line will only allow call forwarding to calls that hit that line directly. The call waiting feature does not work while Call Forward is turned on. What happens when Call Forward is turned on? You can still make calls from your phone. You will hear a short ring when an incoming call is forwarded to remind you that Call Forward is turned on. Callers will hear a busy signal if the destination number is in use and doesn’t have Call Waiting or voicemail. Calls that are unanswered at the destination number will not get sent back to your Shaw voicemail. If you try to set up Call Forward when it’s already turned on, you will hear an announcement that "this feature is already successfully activated". How to I set up a Call Forward? There are two easy ways to manage Call Forward. Either through the phone using star codes or online with the Shaw app. Follow the steps below for your desired method. Lift the receiver and wait for a dial tone. Wait to hear a normal dial tone again. Enter the destination number you want to forward calls to. If it’s a long-distance number, put a '1' in front. Long distance charges will apply. Listen for a ring at the destination number. Pick up the ringing line to turn on the forwarding. If the destination number is busy or there is no answer, hang up and repeat the steps. The destination line will not ring this time. Hang up to turn on forwarding. Hang up when you hear the stutter tone. In your browser, access My Shaw. Toggle the Forward incoming calls button to ON or OFF. Enter the forwarding number with the area code. This feature allows you to define up to four additional numbers which will ring when your main line is called. This can be helpful for having calls ring at home, in your office, and to your cell phone so you don’t miss an important call. This feature can only be used with local numbers. Can I set up Call Forward to go to my voicemail? YES! You can send incoming calls straight to voicemail. This is handy to use when your business is closed for the day or you’ve stepped out of the office, which is especially helpful if your business has a long ring count before calls go to voicemail. You can set this up one of two ways. Either through the phone using star codes or online with the Shaw app. After dialing *72 on the phone and hearing the tone, dial *98 (instead of a 10-digit number). You'll hear a prompt to enter a voicemail PIN, but just hang up. Don't enter a PIN. The call forward will now be active to voicemail. 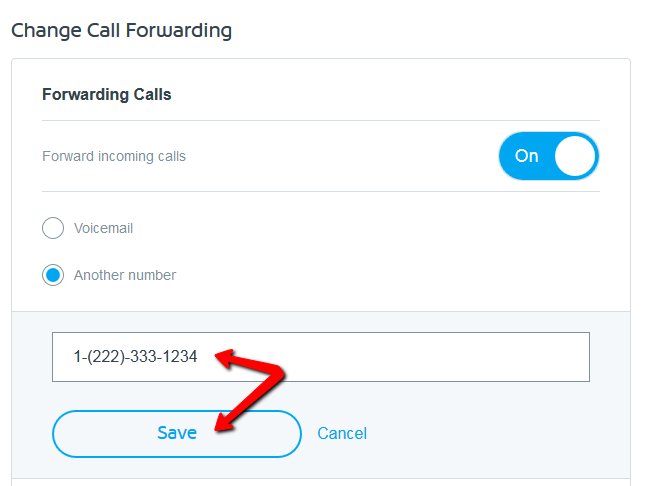 Similar to the regular process for Call Forward above, except the forwarding option is set to voicemail. How do I set up 'Call Forward Busy' and 'Call Forward No Answer'? Use these Call Forward features if you want incoming calls to be directed to another number when you are not available to take a call, either because the line is busy or because the line goes unanswered. Call Forward Busy forwards incoming calls when the line is in use. Call Forward No Answer forwards incoming calls when a line is not answered after set number of rings. A Shaw Business representative has to set up these features before you can use them. Contact Technical Support to enable this feature. Setup can forward to any number, including toll-free and long-distance numbers (long distance charges may apply). Managing this forwarding feature is only possible from the phone on-site at the business, not through My Shaw or by calling Shaw Support. Call Forward Busy cannot be used if the number is part of a Multi-line Hunt. To use Forward to Voicemail with these features, the destination number has to be a line that has voicemail in place. Outgoing calls from secondary (member) lines do not display the main business telephone number. Lift the receiver and wait for the dial tone. Enter the destination number you want to forward calls to. If it’s a long-distance or toll-free number, put a 1 in front (long distance charges may apply).